History: Where is lychee from? If you had chosen Asia, as many would guess, you are correct. Its trees are native from Taiwan, China, and other parts of Southeast Asia. For those that are keeping track, the scientific name is Litchi chinensis and is part of the soapberry family, Sapindaceae. Other fruits from this family include, longan and rambutan. FACT: Eating nine lychees is the equivalent of one serving of fruit. Many people’s first memory of Lychee might be from those little jello cups with lychee flavor and a piece of artifical lychee meat. For ones that have been more blessed, they might have tried lychee in Taiwan, Hong Kong, or other countries. 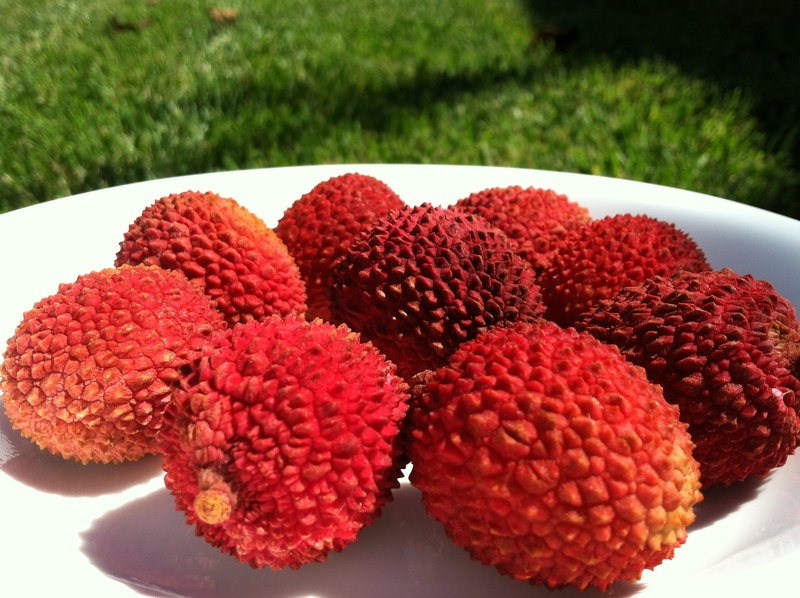 It wasn’t until this past decade and a half that lychee started getting imported into California more frequently. The particular variety seen below are from Mexico (either Sinaloa or San Luis Potosi [specifically La Huasteca]). They grown coupled together on a stick, not individually like plums on a tree. 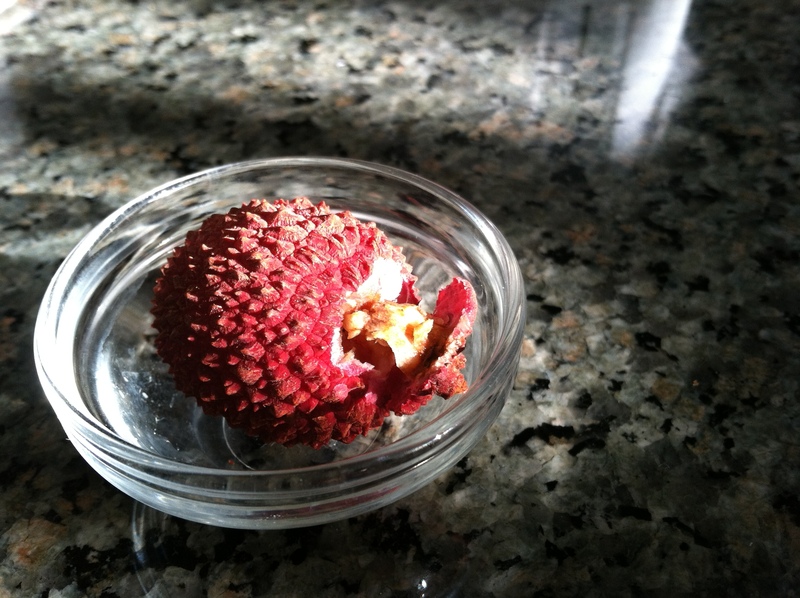 Outer Texture: The lychee looks spiky, and may look a bit sharp to the naked eye. Fear not because it is tamer than a rose bush’s thorn. It is spiky, but dull enough to handle by hand (unlike the durian). The color variation, depending on how fresh it is, varies. Ones shown above are red because of the closer locale of origin; in the past I’ve seen lychees that are brown, but still exhibit its priceless juiciness/taste. The outer shell is actually very thin, with an inner translucent layer separating the outer red epidermis from the fruit inside. Hold the lychee upright and feel for the stem on the top. Push down a little where you feel the gap (this is the top of the seed). Puncture it lightly. If you puncture it from the bottom or start in the middle, the precious juice would leak because you’ll puncture the meat. If you like your lychees dry, then go for it. Now you can get artistic and start slowly peeling in a spiral fashion. Or you can pull back bigger parts of the meat as if you were peeling an orange. Just pop the fruit into your mouth whole, instead of taking a bite out of it (juice leakage). Remember to spit out the seed. If you’re lucky, you’ll get a chicken-tongue seed (which is very small and shriveled up). 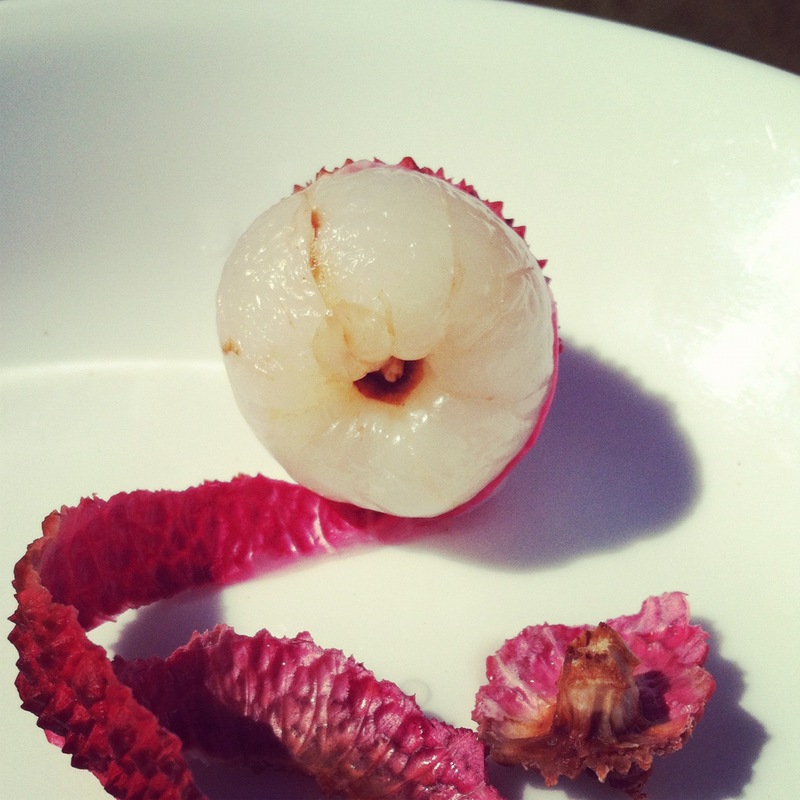 Lychee lovers, how do you like to eat your lychee? What is your favorite dish with lychee in it? Put it in the comments below! Be sure to like http://www.facebook.com/homeyeats for future updates!